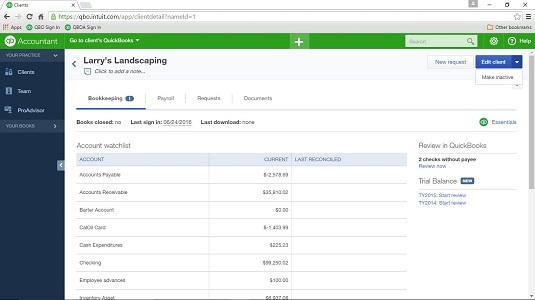 QuickBooks Online offers a free program for accounting professionals. You can sign up for the Wholesale Pricing program and also use QBOA for free. If you choose to do so (and it’s a good choice! ), you will need to know how to manage things. Display the QBOA Clients page. It’s very important to click the client’s name in the Name column; clicking anywhere else on the client’s line won’t work. Scroll down to the Wholesale Clients section and find the company you want remove from your Wholesale Billing subscription. In the Actions column, click Remove from Wholesale. Be aware that your Wholesale Billing subscription needs to be active to enable you to manage client QBO subscriptions. Once you remove a QBO company from your Wholesale Billing subscription, that QBO company will no longer be eligible for the wholesale discount, and all previous discounts will be removed as well. The client QBO subscriber will be billed the standard rate for his subscription unless the client establishes a relationship with another QBOA user. In this case, the client regains the discounts starting from the wholesale billing activation date. Click Clients in QBOA to display your Client List. Click the name of the client you want to make inactive. Click the down arrow beside the Edit Client button. QBO asks if you’re sure you want to make the client inactive. QBO redisplays the page below, but the “(deleted)” appears beside the client’s name and Edit Client button becomes the Make Active button. The client no longer appears on the Clients page. The page you use to make a client inactive. You can change the client’s status back to Active if you opt to display inactive clients on the Clients page. Click the gear button above the table on the Clients page and select the Include Inactive option. QBO displays all your clients, both active and inactive. To make an inactive client active again, repeat the steps in this section, clicking the Make Active button in Step 3. Scroll down to the Wholesale Clients section. Click View QuickBooks Billing History. You’ll also find the option to download your billing history to a comma-separated file that you can view in Excel on this page. So, you’ve decided that you really don’t want to participate in the Wholesale Billing program and manage QBO subscriptions for your clients. Although you can’t cancel your Wholesale Billing subscription, you can stop using it. There’s nothing stopping you from working with clients who manage their own QBO subscriptions. You can’t cancel your Wholesale Billing subscription because that action would also cancel the QBO subscriptions of the clients assigned to your Wholesale Billing subscription. First, you need to remove all the clients currently in your subscription. After you have removed all companies from your Billing Profile, Intuit will no longer bill you because you won’t have any QBO clients in your Wholesale Billing subscription.